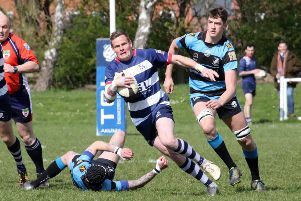 Duncan Leese bagged a brace of tries as Banbury Bulls made it back-to-back wins. Bulls won 47-26 at Stratford-Upon-Avon in Saturday’s Wadworth 6X South West One East derby. Bulls got off to a flying start when Leese slipped a neat pass to Tom Burman who burst through a gap in the line. Burman was stopped just short but he popped a pass off the floor to Tommy Gray who dived over. Ed Phillips converted before a rolling maul was stopped narrowly short of the line. But Ed Phillips got the ball out to Sam Stoop who spun his way out of a tackle before diving over. Phillips added the extras before Bulls conceded several penalties to give Stratford good field position. Eventually the pressure told and Dan Whitby crossed out to the right. Bulls extended their lead when Leese scored his first try for the club. Stoop chipped over the top and a mix-up in defence saw Leese gather the loose ball, step out of a tackle to run in unopposed under the posts and Phillips converted. Bulls secured a try bonus point after the restart when good breaks from Ian Isham and Joe Winpenny got them close to the line. Stoop chipped the ball to the corner and Burman won the race to touchdown. Bulls extended their lead with a fine try from deep. Gray made the break before throwing a dummy to cut inside, he passed to Leese who sprinted over and Phillips converted. Stratford narrowed the gap after a knock-on, Angus Wightman was quickest to react to the loose ball and just managed to stretch his way out for a try and Charlie Powell converted. Bulls responded with their best try of the match. Gray made a break down the right before off-loading to Jed Boyle who drew the final defender and found Phillips who touched down under the posts. Phillips converted before Stratford got their third try following a quickly taken penalty. Scrum half Dave Pritchard tapped and went over with Powell converting. Bulls scored again when Phillips gathered a kick and stepped around one player before off-loading to Isham. The captain stepped around one defender before barrelling through two more and scoring out to the right. Phillips nailed a tricky conversion before Stratford scored a try in added-time following a line-out. Stratford showed good hands as they switched the ball to the opposite flank and Powell went over in the corner before adding the conversion.